This famous line from Shakespeare’s Henry V, describes the Battle of Agincourt and England’s unexpected victory over the French. Not unlike Henry V a small coterie of relatively underfunded and embattled investigators around the world continue to fight an entrenched medical community who refuse to relinquish their grip on the clinical trial process. Their re-review updated from 2004, sheds no new light on the field, as the authors conclude that their 2004 recommendations stand without modification. The authors, to their credit, have updated their database to include cell death endpoints. They cite the ovarian cancer study by Dr. Ian Cree, that assigned 180 patients, (of which 147 were evaluable), with recurrent disease, and reported a response rate of 40.5 percent for assay directed versus 31.3 percent for physician choice, yet failed to achieve significance. The reasons for this trial’s failure however were obvious, as it was underpowered and more importantly allowed the physician’s choice arm to include Dr. Cree’s own drug combinations as the trial accrued. This left Dr. Cree in the uncomfortable position of having to compete with himself. More disturbing is their dismissal of a paper by Selma Ugurel, MD, from Clinical Cancer Research 2006 in which, patients with metastatic melanoma received assay-directed treatment for this otherwise chemo resistant and lethal disease. Patients found drug sensitive in the laboratory had a response rate of 36.4 percent, while those found drug resistant had a response rate of only 16.1 percent (a two-fold improvement). The overall survivals were similarly improved with assay-directed patients 14.6 months vs. drug resistant patients of 7.4 months. Again a doubling. Furthermore these results achieved statistical significance. The ASCO group concludes with the comment, “However, the investigator did not compare the two interventions.” As I know this paper well, and was extremely impressed that some of the responders went out to 30 months, I find the ASCO group’s insouciance surprising. This reminds me of an old joke by the comedian Jerry Seinfeld. It seems that he had watched a television program where a man caught bullets shot from a gun with his bare teeth. Seinfeld went on to say, that despite being immensely impressed by this man’s prowess, he just couldn’t seem remember his name. “What do you got to do to impress people”? As I am familiar with the Ugurel paper, I have been very impressed with these investigators completing a study by dint of their dedication to the field. Stranded without funding or cooperative group support, laboratory-based therapeutics remains unconfirmed, not by the unwillingness of the investigators but by the unwillingness of the cooperative and funding agencies to test the hypotheses. While we squander billions of dollars on genomic analyses that are increasingly leading us nowhere, these ASCO study groups and their colleagues continue to refuse to formally evaluate human tissue studies. In light of the lack of improvement in survival for most cancers over the past 50 years, despite the expenditure of hundreds of billions of dollars on research, perhaps assay-directed therapy is just the solution that medical oncology needs. Many of you may recall that we described our studies with the small molecules BSI201 (iniparib) and AZD2281 (olaparib) (Nagourney, et al. ASCO 2011). Based upon the exciting Phase II data reported by Dr. Joyce O’Shaughnessy, first at the ASCO meeting, then in the NEJM, describing the remarkable efficacy of BSI201 (iniparib) combined with carboplatin and gemcitabine in triple negative breast cancer (TNBC), we initiated a study of both iniparib and olaparib in human breast cancer specimens. Our results were reported at the American Society of Clinical Oncology meeting. Despite the enthusiasm that surrounded Dr. O’Shaughnessy’s initial observations, the confirmatory clinical trial using iniparib combined with carboplatin and gemcitabine, then compared with carboplatin and gemcitabine did not achieve statistical significance. That is, the trial was negative and the combo of inabirib with carboplatin plus gemcitabine was not proven superior. So, what happened? Quite a few things. It turned out that BSI201, a member of the benzamine chemical family, at physiological concentrations achievable in humans is not a PARP inhibitor. This, in retrospect, should have been obvious because a full-dose PARP inhibitor, plus a potent combination of carboplatin plus gemcitabine would not likely be tolerable if PARP inhibition were achieved. Second, the patients receiving the drug are probably not a homogeneous population. That is, some TNBC patients may be similar to the BRCA patients, while others may not have the DNA repair deficiencies associated with PARP inhibitor response. Finally, it was our group that originally reported the carboplatin plus gemcitabine combination in breast cancer, as a split-dose doublet in 2008 (Nagourney, Clin Breast Cancer Research, 2008). We observed, in that original clinical trial, that even a lower starting dose of gemcitabine (i.e. 800mg/ml2 vs. the O’Shaughnessy 1000 mg/m2) resulted in significant toxicity and in our concluding comments in that paper, we suggested 600mg/ml2. At 1000 mg/m2, Dr. O’Shaughnessy’s trial nearly doubled our recommended dose in this patient population. While our abstract did not receive the fanfare of the clinical trial, it was, in fact, remarkably prescient. We, like other investigators, entered into our original studies of these molecules believing iniparib to be a PARP inhibitor. To our surprise, and, in retrospect, to our credit, a direct comparison of olaparib (AZD2281) to inapaprib (BSI201) revealed no correlation. We described this in our abstract, “Of interest, BSI201 & AZD2281 activity did not correlate in parallel analyses (R = 0.07, P > 0.5).” Thus, our human tumor primary culture analysis scooped the ASCO investigators. Unfortunately, it appears they weren’t listening. So, what have we learned? First, we’ve learned that iniparib is not a true PARP inhibitor. Second, we learned that the combination of platins plus gemcitabine in breast cancer is synergistic, highly active and can be toxic (particularly at the doses chosen for this trial). Finally, we learned that TNBC, indeed all breast cancers, even more to the point, all cancers in general, are heterogeneous. That is precisely why the use of human tumor primary culture analyses are so instructive and should be incorporated into clinical trials for these and other targeted agents. For those of you who have been following the recent news coming from the American Society of Clinical Oncology (ASCO) held in Chicago, you have heard of the breakthroughs for the treatment of malignant melanoma. Melanoma, the most lethal form of skin cancer, arises as a pigmented lesion (mole or large freckle), generally in sun-exposed areas. Though curable in its earliest stages, once these malignancies disseminate, they can be the most aggressive and hard to treat cancers known to oncologists. That is, until recently when two important discoveries were made. The first discovery actually dates back many years. It turns out that melanoma is one of those cancers that occasionally, spontaneously, regresses and that a subset of patients respond to interferon (an immune protein). This suggested a role for the immune system. The next piece of evidence came from work in the 1980s, conducted by Steven Rosenberg, MD, PhD, at the National Cancer Institute. Using a genetically engineered human protein (interleukin 2-IL2), these investigators reported responses in patients with metastatic melanoma. Again, an immune component to this dreaded disease. Fast-forward two decades. Investigators unraveling the complexities of human immunity realized that the cancer cells weren’t being recognized and effectively controlled by lymphocytes. Something was dampening the immune response. With the discovery of ipilumumab, an antibody directed against CTL4, scientists could now turn off the “off” switch, thereby turning on the immune system. Survival advantages have been substantial. This therapy is now available to patients in need. The second discovery represents a triumph for “targeted” therapy. As the gene BRAF, was recognized to be mutated in the majority of melanoma patients, drugs were developed to turn off this important pathway. Unfortunately, the first generation BRAF inhibitor sorafenib, could not shut down what proved to be the most common variant of the BRAF mutation, known as V600E. To the rescue came a compound now known as vemurafenib. By turning off the V600E signal, those patients with this specific mutation (about 60 percent) responded dramatically. While both these discoveries are meritorious, the responses in most patients unfortunately have not been very durable, with relapses generally occurring months or the first year after starting therapy. Interestingly, secondary pathways, like N-RAS and C-RAF, may step to the fore and overtake the effect of the BRAF inhibition. This offers hope that third generation small molecules will address these resistant clones. In our laboratory, we are currently examining small molecules that inhibit the RAS and other pathways to determine whether new strategies may overcome these resistance mechanisms in melanoma. As a proof of concept, these reports from ASCO establish that the era of targeted therapy in melanoma is here. As I mentioned in a previous post, I recently presented “Phase II Trial of Personalized Chemotherapy In Stage IV NSCLC: Clinical Application of Functional Profiling in First-Line Therapy” (Abstract No. 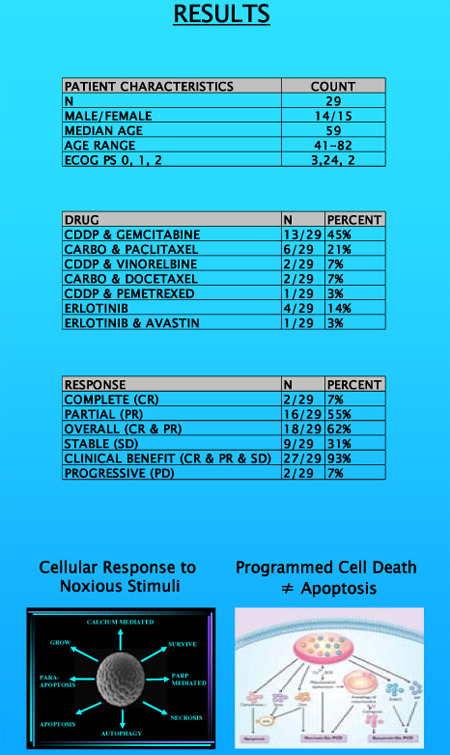 7617; Citation: J. Clin Oncol 28:7s, 2010) at the 2010 ASCO Annual Meeting. Following are shots of the poster that was presented. I encourage you to leave any comments and/or questions here as I would be pleased to respond to your inquiries. 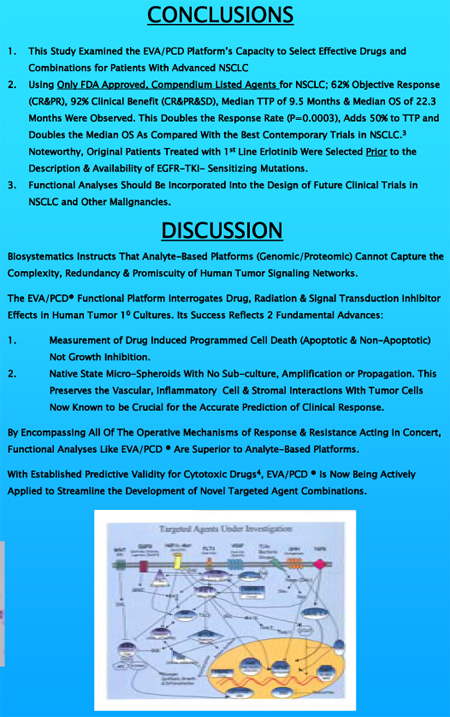 As I mentioned in my last post, in our presentation at the 2010 ASCO Annual Meeting, we showed clinical response rates were doubled by using the Ex-Vivo Analysis of Programmed Cell Death (EVA-PCD®) platform with standard FDA approved chemotherapeutic agents in NSCLC patients. If we can achieve these types of results by simply reconfiguring existing drugs, it suggests that the EVA-PCD platform could provide even better results as we introduce larger numbers of active, targeted agents. One such agent, PF-1066 provided an overall response rate of 64 percent when patients were selected for the EML4-ALK fusion oncogene. This type of approach, the selection of candidates for therapy predicated upon the biology of the patient, is precisely the premise underlying all of our work. While the PF-1066 data was strongly positive, it represented a very select population of lung cancer patients who carry a specific gene profile. Of all NSCLC patients, only 3-4 percent carry this gene. While recognizing targets like EGFR and ALK continue to improve responses, the EVA-PCD platform is capable of identifying patients for response even when the specific underlying genetic mechanism may be less well characterized. The capacity of the EVA-PCD platform to measure global cellular response enables us to select candidates for whom no known genetic predisposition exists. 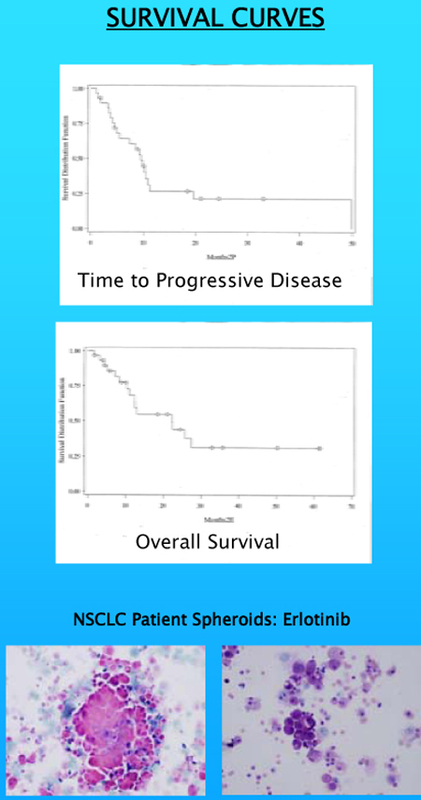 On Sunday, June 6, 2010, I presented “Phase II Trial of Personalized Chemotherapy In Stage IV NSCLC: Clinical Application of Functional Profiling in First-Line Therapy” (Abstract No. 7617; Citation: J. Clin Oncol 28:7s, 2010) at the 2010 ASCO Annual Meeting. Colleagues received the presentation very well, with hundreds of attendees examining the findings. The data are very exciting. This trial of 29 patients with metastatic (Stage IV) NSCLC achieved a response that was twofold higher than the national average (62 vs. 31 percent: p=0.0003). More striking was the 50 percent improvement of median time to progression (9.5 months vs. 6 months). And most exciting of all, the very excellent survival data with a median overall survival of 22.3 months compared with the national average of 12 months. The most interesting aspect of this study is the fact that we utilized the very same chemotherapy drugs that are available to all medical oncologists in the United States. 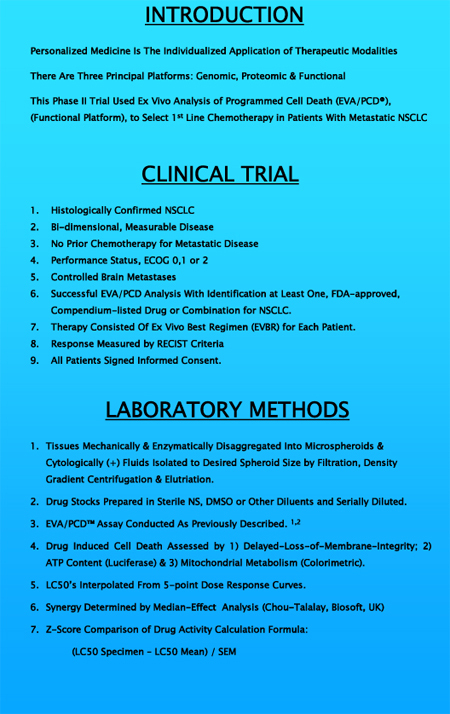 The trial was limited to FDA approved, compendium listed agents with specific indications for NSCLC. As such, we did not apply new classes of drugs, yet doubled the response rate and median overall survival. The implications of this are staggering, particularly when we consider the impact that targeted agents are having on cancer care. I will explore these implications in the next entry when I discuss such agents.